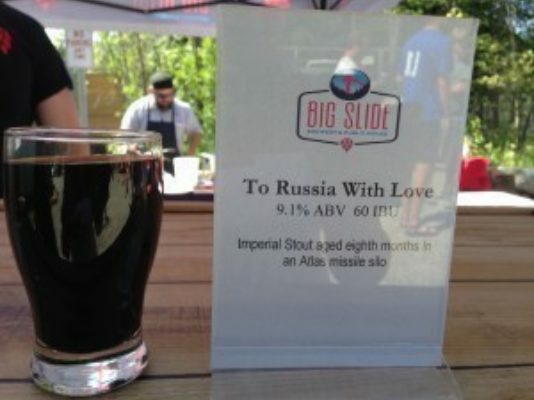 To Russia, With Love - our Russian Imperial Stout, aged 6 months in a decommissioned Atlas Missile silo, will be bottled and released on Friday, September 9th. These champagne-style bottles are available for pre-order now. Cost is $18 each, with a pre-order max of 4. Bottles will be $20 on Sept 9th, with no maximum purchase, and then $22 after Sept 9th. This beer is delicious now but will lay down well for aging. Rich, thick, roasty, with a touch of dark fruit. Reserve your four bottles today. NOTE: All pre-sale bottles will be available for pick-up at Big Slide Brewery on or after September 9th. 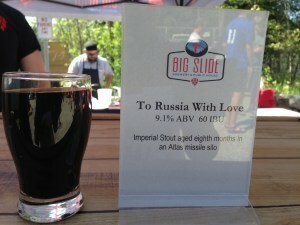 Due to state liquor laws, we are unable to ship this beer - you must pick it up at Big Slide.